Welcome to Sawyer Waterscaping! We specialize in designing and creating natural waterscapes. If you are considering enhancing your landscape with a custom water feature designed specifically for your yard, you have come to the right place! Since 1999, we have installed all types of water features including ponds, waterfalls & streams, pond-less waterfalls, and custom fountains. We do offer additional services such as boulder retaining walls, flagstone patios, xeriscaping, and general landscaping. Visit our gallery to see all kinds of examples of our work. You can also visit our photo uploads on our facebook, instagram, and pinterest pages. Stop by our office, to see several water features on display that will help you envision a beautiful and relaxing water feature in your very own yard. You can also tour our anytime pond tour to see all kinds of water feature designs. We built our first pond in the summer of 1988! Yes, some 30 years ago. The idea all started with a trip to Sutherlands, a local hardware store that had a small plastic pond on display. 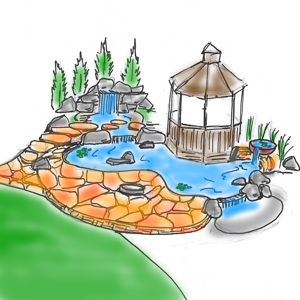 The idea of creating a backyard oasis complete with running water, fish and a pond had me extremely excited. Sit back, relax, and enjoy the soothing sights and sounds of running water. Feel the cares of the world slip away as you enjoy your personal vacation spot! Our ponds are self-sustaining, require very little maintenance, and provide an opportunity to have fish without the upkeep of an aquarium. Pond plants are the easiest gardening you will ever do. 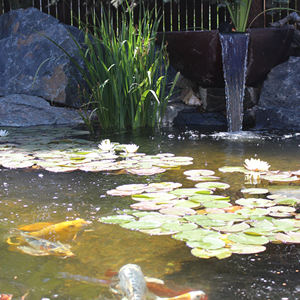 Check out our pond gallery and learn how our ponds work! Pond-less waterfalls are certainly the most sought after feature we install. They give you the soothing sounds and relaxing atmosphere without the size requirements of a pond. Waterfalls are extremely low maintenance, energy efficient, and attract a variety of wildlife. And the best part is that children love exploring nature in and around the waterfall. Whether you add a waterfall to your front or backyard, you will want to make sure to place it near a window so the melodious sound can be enjoyed from inside your home, too! Pond-less waterfalls are available in a variety of sizes and configurations, and is a great option for both small and large outdoor spaces. Check out our pond-less photo gallery and learn how they work here! FountainFalls are great in flat, small areas. Water flows over one or two large boulders while dropping directly into a pond-less reservoir. There is very little maintenance and it gives you that big waterfall sound while taking up little to no space. The two types of boulders we use are fractured granite and moss boulders. Both give a different and unique look. 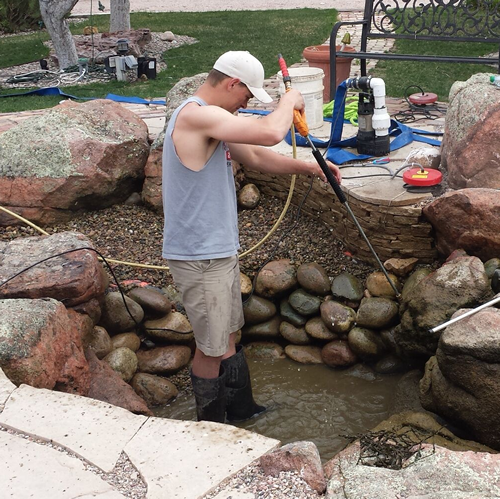 Best of all, FountainFalls are an inexpensive way to bring the waterscaping lifestyle to your home! Check out our FountianFalls photo Gallery! Basalt Column Fountains provide a nice vertical waterfall in flat spaces. These columns are also great add-ons to any pond or pond-less feature. The are typically installed in a pond-less setup with no visible pool of water. They do create nice, soothing sounds with a more formal look. Our rock of choice for the basalt columns come from the Columbia River in Washington State. They formed millions of years ago from large volcanic flows creating long solid columns of basalt. The columns are then drilled allowing water to be pumped up through them as they stand vertical. Check out our Basalt Column Fountain Photo Gallery here!